The Monastery is absolutely delighted to be sponsoring and hosting England's first ever Peace Mala Festival for Interfaith and Culture in Education. Our building used to be a Franciscan Church and Friary and this event is taking place on a very special day for us - Monday the 4th October, the traditional Feast Day of St Francis. All of the Monastery's work is based on Franciscan values, but in a way that is relevant and appropriate for today. Our deconsecrated building operates as a Venue and as a Modern Day Monastery we welcome people from all walks of life and from all faiths, cultures and beliefs. Just like St Francis, we are passionate about promoting the messages of love, peace and harmony, and encouraging everyone to respect our planet and all living beings, for the benefit of humanity. Peace Mala is a wonderful way of spreading that message throughout the world. We are delighted to be Ambassadors for Peace Mala and hosts for the Festival. The powerful, yet simple message of the Peace Mala bracelet is a unique gift for the children of today who will be shaping the world of tomorrow - it should be used by Teachers, Schools, Faith Leaders and Educators everywhere. Elaine is co-founder of the Charitable Trust that raised the £6.5million to save and restore Gorton Monastery and found a sustainable new use for the future of this previously endangered World Monument site. Elaine is currently Chief Executive of the Monastery Manchester, the social enterprise company that operates the restored heritage site as a corporate, cultural and community venue. The experience of delivering the Monastery project over the past 12 years has turned Elaine into a passionate advocate for sustainable communities and heritage and spiritually led regeneration. Elaine was awarded an MBE for services to heritage in 2007. As a graduate in Food Science and Nutrition, for over 25 years Elaine's professional career was in the Food Industry where she held senior positions before establishing her own successful sales and marketing consultancy. She relinquished her career to champion the salvation of the Monastery. Elaine was a Board Member of the Princes' Trust in Cheshire until 1999. 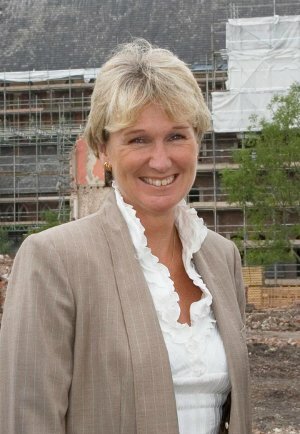 She is currently Chair of the Council for Manchester Cathedral which is central to Manchester's regeneration plans for the Medieval Quarter of the city.